Who on earth understands the Supreme Divine descended as Sri Sathya Sai??? Bhagawan Himself asserts that He Is beyond the reach of the most tintensive inquiry and the most meticulous measurement… Yet, out of His infinite love, time and again Bhagawan has spoken about Himself, revealing interesting facets of His Supreme Avataric Mission. Excerpted from Bhagawan’s Divine discourse delivered on June 19, 1974. God Is inscrutable. He cannot be realised in the outer objective world; He is in the very heart of every being. Gemstones have to be sought deep underground; they do not float in midair. Seek God in the depths of your self, not in the tantalising, kaleidoscopic nature. The body is granted to you for this high purpose; but, you are now misusing it, like the person who cooked his daily food in the gem-studded gold vase that came into his hands as a heirloom. Each religion forgets that God is all Forms and all Names, all attributes and all assertions. The Religion of Humanity is the sum and substance of all these partial faiths; for, there is only one Religion and that is the Religion of Love. The various limbs of the elephant that seemed separate and distinct to the eyeless seekers of its truth were all fostered and activated by one single stream of blood; the various religions and faiths that feel separate and distinct are all fostered by single stream of Love. The optical sense cannot visualise the Truth. It gives only false and barren information. For example, there are many who observe My actions and start declaring that My nature is such and such. They are unable to gauge the sanctity, the majesty and the Eternal Reality That Is Me. The power of Sai is limitless; It manifests for ever. All forms of `power ‘ are resident in this Sai palm. But, those who profess to have understood Me, the scholars, the yogis, the pundits, the jnanis, all of them are aware only of the least important, the casual external manifestation of an infinitesimal part of that power, namely, the “miracles”! They have not desired to contact the Source of all Power and all Wisdom, that is available here at Brindavan, They are satisfied when they secure a chance to exhibit their book learning and parade their scholarship in vedic lore, not realising that the Person from Whom the Vedas emanated is in their midst, for their sake. This has been the case, in all ages. People may be very near (physically) to the Avatar, but, they live out their lives unaware of their fortune, but exaggerating the role of miracles, which are as trivial when compared to My glory and majesty, as a mosquito is in size and strength to the elephant upon which it squats. Therefore, when you speak about these ‘miracles’, I laugh within Myself out of pity, that you allow yourself so easily to lose the precious awareness of My reality. My Power is immeasurable; My Truth is inexplicable, unfathomable. I Am announcing this about Me, for, the need has arisen. But, what I Am doing now is only the gift of a `Visiting Card’! Let Me tell you that emphatic declarations of the Truth by Avatars were made so clearly and so unmistakably only by Krishna. In spite of the declaration, you will notice in the career of the same Krishna that He underwent defeat in His efforts and endeavours, on a few occasions, though you must also note that those defeats too were part of the drama which He had planned and which He Himself directed. When many Kings pleaded with Him to avert the war with the Kauravas, He confessed that His mission to the Kaurava Court for ensuring peace had ‘failed’! But, He had not willed that it should succeed. He had decided that the war would be waged. His mission was intended to publish the greed and iniquity of the Kauravas and to condemn them before the whole world. But, I must tell you, that during this Sai Avatar, there is no place for even such ‘drama’ with scenes of failures and defeats! What I Will, must take place; what I Plan must succeed. I Am Truth; and Truth has no need to hesitate, or fear, or bend. ’Willing’ is superfluous for Me. For, My grace is ever available to devotees who have steady Love and Faith. Since I move among them, talking and singing, even intellectuals are unable to grasp My Truth, My Power, My Glory, or My Real Task as Avatar. I can solve any problem however knotty. I Am beyond the reach of the most intensive inquiry and the most meticulous measurement. Only those who have recognised My Love and experienced that Love can assert that they have glimpsed My Reality, for, the Path of Love is the Royal Road that leads mankind to Me. Do not attempt to know Me through the external eyes. When you go to a temple and stand before the image of God, you pray with closed eyes, don’t you? Why? Because you feel that the Inner Eye of Wisdom alone can reveal Him to you. Therefore, do not crave from Me trivial material objects; but, crave for Me, and you would be rewarded. Not that you should not receive whatever objects I give as sign of grace out of the fullness of Love. I shall tell you why I give these rings, talismans, rosaries etc. It is to mark the bond between Me and those to whom they are given. When calamity befalls them, the article comes to Me in a flash and returns in a flash taking from Me the remedial grace of protection. That grace is available to all who call on Me in any Name or Form, not merely to those who wear these gifts. Love is the bond that wins grace. Consider the meaning of the Name, Sai Baba. ‘Sa’ means `Divine’; ai or ‘ayi’ means `Mother’ and ‘Baba’ means Father. The Name indicates the Divine Mother and Father, just as Sambasiva, which also means the Divine Mother and Father (Sa-ambasiva). Your physical parents might cultivate Love with a dose of selfishness; but, this Sai “Mother and Father” showers affection or reprimands, only for leading you towards victory in the struggle for self-realisation. For, this Sai has come in order to achieve the supreme task of uniting as one family the entire mankind, through the bond of brotherhood, of affirming and illumining the Atmic Reality of each being in order to reveal the Divine Which is the Basis on which the entire Cosmos rests, and of instructing all to recognise the common Divine heritage that binds man to man, so that man can rid himself of the animal, and rise into the Divinity which is his goal. I Am The Embodiment of Love; Love is My Instrument. There is no creature without Love; the lowest loves itself, at least. And its self is God. So, there are no atheists, though some might dislike Him or refuse Him, as malarial patients dislike sweets or diabetic patients refuse to have anything to do with sweets! Those who preen themselves as atheists will one day, when their illness is gone, relish God and revere Him. I had to tell you so much about My Truth, for, I desire that you should contemplate on this and derive joy therefrom, so that you may be inspired to observe the disciplines laid down and progress towards the Goal of Self-realisation, the Realisation of the Sai that shines in your hearts. Where world becomes a stage and the body a costume to deliver the alloted role man should tread with atmost caution reminds Bhagawan…delivering a discourse on the importance of The Company desired to keep… Bhagawan says, The company you join must be qualitatively and quantitatively greater and higehr than the one in which you are now caught. From Bhagawan’s Divine discoures at Brindavan, Whitefiled, on 7 July 1975. Kamal Sahani, of the Second B. Com. class of the College spoke now, using fine simple appropriate words, on the human body and the purpose for which it has been given to you. He said that the world is a stage and that the body is a costume that one has to wear in order to act the role that God has allotted to you in the play produced and directed by Him. This is a correct interpretation. But, when you are allotted a part, your duty is to do it well and earn the appreciation of the Director. The stage on which you play your role is an infinitesimal dot when compared with the vast unlimited Cosmic space. The time when you strut about the stage in this costume or in any other is also infinitesimal. Deepak of this College acted as Sankaracharya on the stage at the Shanmukhananda Hall, Bombay. But, his Deepak-ness was not lost thereby; even while he was Sankaracharya, he was Deepak. His Sankaracharya-hood was but a temporary phase. So too, the Atma is the Eternal Truth; the body which it dons is temporary and the role it induces is also short. Or, to illustrate this in another way—the time spent in dreams is infinitesimal, when compared with the time spent awake. The ‘waking’ stage is the representative of the stage of wisdom and illumination, of the Atma; the dream stage is the representative of the ’ignorance wisdom’ hazy stage of human life. The question may legitimately be asked, why or how did this eternal universal Atmic principle take up residence in this temporary, particularised body box? Well. You do not keep diamonds in a diamond casket, do you? If you do, the robber would be doubly benefitted. You keep it in an iron box only. Of course, the iron box or safe will be artistic and charming, for, the container is chosen, to suit the value or sanctity of the thing contained. To drink milk or some such beverage, you select a clean attractive tumbler or cup. But, for a spittoon, inferior metals or mud is felt ample. The body is a chalice, wherein you collect the nectar of Divine Grace. That is the prime purpose for which it has been gifted, to you. For, without a cup or chalice, casket or jug, how can the nectar be taken? Raso Vai Sah: say the Vedas; “He Is Sweet-Nectar, no less.” And when His Graces is showered, the body is thrilled. The Body has to be kept ever clean and pure, unaffected by dirt, disease, distress, or defeatism. Nara and Narayana, man and God are like iron and magnet. God by His very nature attracts man near, for in man, there is the Divine. When the magnet fails to attract the iron piece, the iron foolishly concludes that the magnet has lost its power! The real fact is: the piece of iron is too thickly covered by rust and dust. It does not realise its own defect; it rushes to blame God (the magnet) or even to deny Him! The easiest and the most fruitful method of keeping yourself free from dust and rust is the Satsang. The company of the good and the godly will slowly and surely chasten and cleanse the persons prone to stray away from the straight path towards Self-Realisation. Care has to be taken to see that you select and stick to the proper company. A cup of water has no cash value; but, if it is poured into ten cups of water, it acquires the value that people attach to milk! If on the other hand, one cup of milk is poured into ten cups of water, it loses the value it had and is condemned as useless. So, the Satsang you join must be purer, more venerable, and sticking to higher ideals of virtue and truth than you yourselves. When a smoker joins a group of non smokers, there is every likelihood of his giving up that bad habit; but, when a non smoker falls into a den of smokers, he is certain to become a victim soon! Such is the subtle influence of the company one keeps. The company you join must be qualitatively and quantitatively greater and higher than the one in which you are now caught. There are precious gems of wisdom within your hearts, which require excavation, in order to be of any benefit to you. Intelligence is the instrument you have to use, in order to gain them. At the very start, you will encounter a boulder barring your way—that is the Body Consciousness, the Ego. Desires are the loose rocks that have also to be dug out and kept aside. Then, you come to a bed of sand—good thoughts, good words, good deeds; when this stratum is reached, you are nearing success. If you keep on in Satsang, every day, your hearts will maintain their purity unimpaired; but, if you seek one, only off and on, it will be difficult to win grace or partake of it, for, the vessel will be tarnished and untidy. In your own households, you must have noticed that a vessel in daily use is bright and clean; but, vessels stored and used only now and then will have to be scrubbed with great vigour to become bright. You must take all the trouble and welcome all the patience needed, to seek Satsang and remain therein. For, it is not being born a man that is the sign of the glory; it is living as a man that confers the dignity. Great Masters with complete awareness know what they do… and so with Avatars… it will be foolhardy for man to attempt to gauge their actions, rather man should submit to the will of Great Masters and Avatars… Years ago, Bhagawan Nithyananda of Ganeshpuri had direted one of His disciples to visit Bhagawan Sri Sathya Sai… For Swami Shradhanand, the trip turned out to be an ‘enlightening’ one… enlightened to know that God Is One…and One Only!!! …narrates Dr DJ Gadhia. Swami Shradhanand, a disciple of Swami Nithyananda of Ganeshpuri (or Vajreshwari) near Mumbai, attended one of these programmes in 1962. Soon after the Arati, he went into meditation. Later, he came to us and said, “My Guru has suggested that I should have the Darshan of Bhagavan Sri Sathya Sai Baba only with Dr Gadhia”. So, we proceeded to Puttaparthi on the very next day. A very memorable incident happened in the interview room. When Swami started waving His right hand to materialise Vibhuti, Swami Shradhanand caught hold of His hand! All devotees in the room were stunned. I was utterly shocked because it seemed to me that Swami was insulted by a person that I brought. Bhagawan replied, “Swami knows that you recite Gayatri Mantra everyday and your Sadhana has reached up to the point of saturation so much so that you are going to get liberation soon. So, continue with your Sadhana.” Nobody was aware of this. Swami Shradhanand was surprised and became happy and apologised for his mistake. Then Swami said, “Don’t worry, mistakes are like passing clouds. Let Swami distribute peppermint and chocolates to these children.” He waved His hand and materialised Vibhuti and distributed to all, except Swami Shradhanand! When Baba granted him a personal interview, Swami Shradhanand started shedding tears of joy and prostrated at the Lotus Feet of Bhagawan, saying, “Oh my Master! 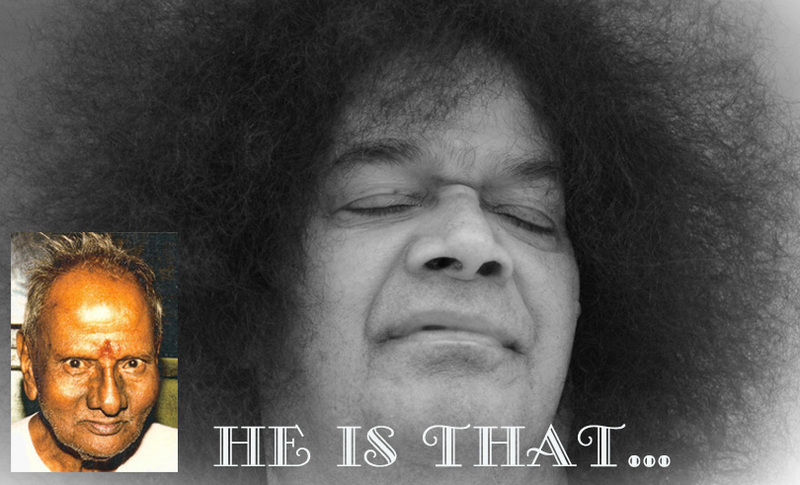 You Are residing here in the form of Sri Sathya Sai. 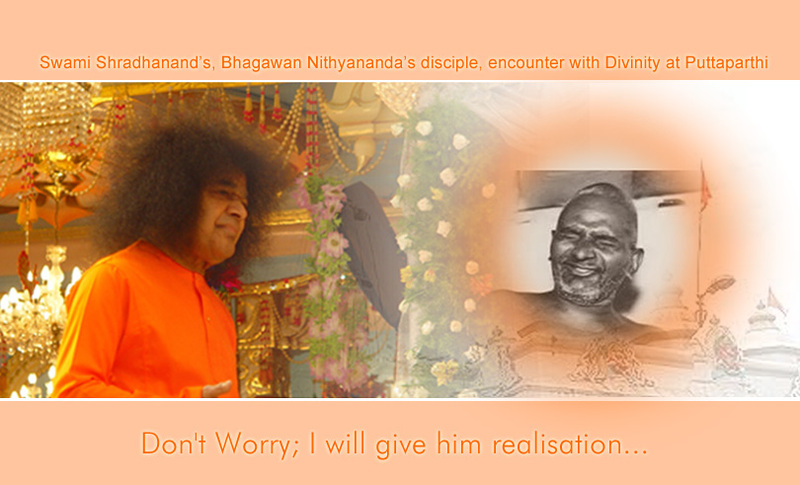 I am very grateful to You for granting me this Vision!” Swami Shradhanand would just not stop crying. We learnt a great lesson. Swami can give realisation of any form or Guru or any incarnation to anyone deserving, and that is the reason why He is known as `Sarva Devata Swarupa’. Avatars Who live in the most exalted state of ‘Brahmam’ have nothing to differentiate between many forms and many names… All names and all forms belong to the One Supreme Godhood. …And when They continue Their sojourn on the physical plane they do leave indelible impressions in the human hearts and minds, teaching them the most subtle truth and lessons. In one such incident Bhagawan at Shirdi taught His devotees not to disrespect any God-Forms… an interesting episode from Sree Sai Samartha Satcharita, originall written in Marathi byGovind Raghunath Dabholkar a.k.a. Hemadpant. A beautiful lesson commemorating The Advent of Bhagawan at Shirdi. One day Baba returned from the Lendi and sat in the Masjid. The devotees began arriving for darshan. Amongst them was the great devotee Chandorkar whom Baba loved very much. He came with Biniwale, (his brother-in-law), eager for darshan. After doing obeisance to Sainath, both of them sat in front of Him. While they were exchanging generalities about the welfare and well being, Baba suddenly got ‘angry’. Listening to this Nana became dejected. He wondered about the reason for this anger but could not recall anything. He felt sad. He could not recall where he had erred. He could find no reason for the ‘anger’. But unless something had happened Baba would never ‘hurt’ anybody. “Though you have been in association with Me for so many years, how could you have acted like thus? What happened to your senses?” Baba asked Nana. Hearing this Nana realised his mistake and his face fell immediately. Though he felt ashamed to speak of it, he narrated it. Nothing could be concealed here! Having decided this, Nana told Baba whatever had happened in detail. There could be no lying before Sai. Falsehood does not gain Sai’s grace. Disharmony leads to destruction and ultimately lies lead one to hell. To deceive the Guru is a very great sin, from which there is no atonement. Realising this Nana described in detail to Baba whatever had happened. Nana said: “We hired a tonga to come straight to Shirdi, as a result of which Biniwale missed the darshan of Lord Dutta on the banks of the Godavari. Biniwale is a Dutta devotee. When we came across the Dutta temple on the way, he wanted to get down to have Dutta’s darshan. But I was in a hurry, so I prevented him and told him that we could take the darshan on our return journey from Shirdi. Thus becoming hasty and thinking it would get late to come to Shirdi, I tried to avoid the matter and disregarded Dutta’s darshan. Then Baba advised: “It is not good to be in such a haste. Thank your stars that you had only the thorn to contend with, though you had disrespected the darshan.